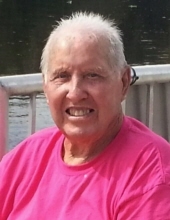 Coy H. Green, age 83, widower of Anna Faye Covington Green, passed away Monday, February 4, 2019 in Georgetown, Kentucky. He was born May 2, 1935 in Bourbon County, Kentucky to the late Charles and Mandy Hornback Green. Coy was a life long farmer, received the Pioneer Farmer Award and won several tobacco cutting contest in Bourbon County. He was a member of Jordan Baptist Church, a former member of Stamping Ground Ruitan Club, played slow pitch softball and was an avid U.K. basketball fan. Coy is survived by his children, Sheila Faye (Jerry) Evans of Prosper, Texas, Coy (Carol) Green Jr. of Georgetown, Kentucky, Barbara (Billy) Willhoite of Ormond Beach, Florida, Rhonda (Jeff) McFarland of Sadieville, Kentucky; grandchildren, Chris (Elizabeth) Willoughby, Coy Green, III, Brandon (Stephanie) Green, Jeri Lynn Evans, Tabatha (John) Tackett, and Caleb (Katelyn) McFarland, Stacy (Jacky) Dye and Ray (Phillene) Humphrey and great grandchildren, Corbin Willoughby, Luke Willoughby, Ian Tackett, Anna Tackett, Isaac Tackett, Parker Green, Laurel Rose Green, Jocelyn McFarland, Emmie Dye, Keason Dye, Kylie Dye, Tiason Dye, Zack Humphrey, Tyler Prather, and Karli Pennington. Coy is also survived by his sister, Jean Fain of Georgetown, Kentucky and his brother, Donald Green of Versailles, Kentucky and his special friend, Pauline Bruce. Coy was preceded in death by his sisters and brothers, Mildred Spence, Louise Bryant, Carol Hammons, his twin Roy Green, Roger Green, Robert Green, Milton Green, Ronald Green and Forest Green. Visitation will be 5 to 8 on February, 7, 2019 at Tucker, Yocum & Wilson Funeral Home. Funeral services will be 11:00 a.m. Friday at the funeral home with Pastor Tom Byrd and Pastor Rob Jeffries officiating. Burial will follow the service at Crestlawn Memorial Gardens with pallbearers being Chris Willoughby, Coy Green III, Brandon Green, Jeri Lynn Evans, Tabatha Tackett, Caleb McFarland, Lewis Jones. Honorary bearers will be Jean Fain and Donald Ray Green. Online condolences maybe expressed to the family at www.tuckeryocumwilson.com. To send flowers or a remembrance gift to the family of Coy H. Green, please visit our Tribute Store. "Email Address" would like to share the life celebration of Coy H. Green. Click on the "link" to go to share a favorite memory or leave a condolence message for the family.